Eleven teams representing nine Pennsylvania schools will be competing at the 2018 NAQT Small School National Championship Tournament in Chicago this weekend. These teams qualified for SSNCT by finishing in the top 30% of teams from eligible schools at tournaments and leagues throughout the state, and they will be competing in separate Traditional Public and Open divisions. The complete field is here. 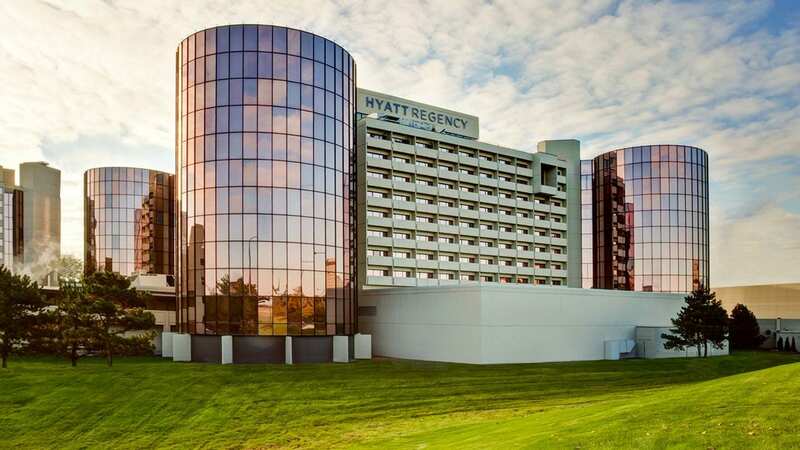 The Hyatt Regency O’Hare in Chicago will host SSNCT. Like HSNCT, there have been some changes to the format this year. In both divisions, teams will be playing ten power-matched prelim games on Saturday using a card system, and those with a winning record (6-4 or better) will make the next day’s playoffs. This is up from the 9 games SSNCT has used in the past. In the playoffs, double elimination will reign. Further details can be found in our guide to national championships. Last year’s set was approximately the same difficulty as a NAQT IS set. After winning last year’s Very Small School title and taking 3rd place in the 2017 Traditional Public division, several of this year’s players have experience with the format and the pressure of competing at SSNCT. Camp Hill has finished 11th or better among Small Schools for seven years running. Lead scorer Sydney has strong literature and mythology knowledge, and steady contributions from Alex and Ben helped them to a 1st place win at the Penn State Spring Academic Bowl last month. Their points-per-bonus on IS sets has improved throughout the year, increasing almost two points from 15.88 PPB at Henderson in November to 17.74 PPB at Allderdice in January. They have not found a replacement for last year’s GPQB First Team All-Star Colton, however, so they are unlikely to reach the peaks of last season’s run. Andrew, David, and Max form a solid core for this team, each contributing around 20 to 30 points per game at the three tournaments they played together. We’re not sure what their team lineups will be at SSNCT (Andrew played on B for Penn State’s tournament, where he put up 72.22 individual PPG), but assuming their best players play together, their A team could be fairly potent while the B team might struggle some. Lakeland is led by star player Michael Goerlitz, who has a strong power rate and will likely be in contention for a tournament All-Star scoring award at SSNCT. Though several players from their 2017 team graduated, Michael’s rapid improvement this year could carry them to an even higher finish than last year’s T-19 result. A regular on the WVIA Scholastic Scrimmage show in northeast PA, Riverside made their pyramidal debut at Wallenpaupack’s Big Lake Brawl in February. They showed improvement over the course of their first tournament and ended up winning three of their four afternoon games, and I expect that their stats will keep improving as they continue to get accustomed to quizbowl’s format and the structure of SSNCT. Evan, Sophia, and Drew provide balanced scoring, and some of their players have past SSNCT experience from playing on last year’s team. With a good power rate this year, I expect that they’ll do as well as (or possibly even better than) last year’s T-29. Another team that has improved its power rate and PPB over the course of the year, Westmont Hilltop is led by senior player Ethan with good contributions from his teammates. Some players might have experience from playing on last year’s SSNCT team, which finished T-29. This formidable team was ranked 4th in PA in our midseason poll, and just last weekend they managed to defeat one of the country’s strongest high school teams on a collegiate set. Richard has emerged as their lead scorer followed by Jake and Rudyard, both of whom also provide deep knowledge and high point totals. Their impressive power rate and strong bonus conversion (their season best was 22.30 PPB on an IS set at Henderson) have combined for high tournament finishes throughout the year, and they should do very well at SSNCT. They have a tendency to have an occasional game where they will come down with a case of the negs, however, so they will need to ensure that they play clean during playoffs. With experience from playing on last year’s B team at SSNCT, current sophomores Alex and Neil have shown the ability to provide a one-two punch for this year’s A team. Their 16-17 PPB on A sets this year indicates that they’ll put up solid stats and get some wins at SSNCT. After taking 4th in their division at the 2017 SSNCT and making an extraordinary run to 9th place at last year’s HSNCT, their entire A team graduated and they had a coaching change. However, they’ve shown that they are still an extremely talented team, continuing their strategy of balanced scoring and specialist players. They won the Allderdice Invitational with all four players exceeding 25 PPG and 20.50 PPB, so they are in a good position to make a deep run into the playoffs this weekend. Good luck to everyone at SSNCT! If you’d like updates from the tournament, be sure to follow NAQT’s livebloggers and their tournament coverage on Twitter (@NAQTLive) and Instagram (@NAQTqb). Congratulations to Vishwa Shanmugam of Downingtown STEM Academy for winning Player of the Year for the 2017-18 season. In the span of a year and a half, Vishwa has gone from first-time player to a nationally elite powerhouse, displaying exemplary knowledge in the categories of science and literature in particular. His high scoring has made STEM an overnight sensation in the larger quizbowl community, let alone Pennsylvania. Better yet, he is an honorable and friendly competitor who clearly has the respect of his teammates and opponents. Congratulations to Connor Mayers of Penn Manor High School for winning JV Player of the Year* for the 2017-18 season. This award recognizes Connor’s leadership in helping Penn Manor to a number of high tournament finishes this season and his activity in trying to organize better quizbowl events in the broader Lancaster area. We look forward to seeing what Connor and the other JV players around the state can accomplish in the remainder of their playing careers. Congratulations to Abbi Smith of Friends Select School for winning Coach of the Year for the 2017-18 season. She has stewarded the growth of what has rapidly become one of the strongest quizbowl clubs in PA in both caliber of play and numbers of students, always encouraging her team to achieve their best and incorporating the principles of a Quaker education into their play and training. The award also recognizes her leadership in organizing well-run tournaments and spreading quizbowl to other schools in the city of Philadelphia. All recipients of the GPQB awards will be awarded a plaque for their achievement. We are honored to have all these individuals as part of the Pennsylvania quizbowl community and wish them continued success, both on and off the buzzer. *Students are eligible to win the JV Player of the Year Award if they are currently enrolled in the 9th or 10th grade. Students may not win either award more than once in their playing career. We are happy to announce that our student contributor, Jackie Wu, has been promoted to full membership in GPQB, effective immediately. Jackie has been responsible for a number of wrap-up pieces this year, and more importantly, created and has regularly updated GPQB’s Instagram account. She has also won the Cooper Young Ambassador Award from PACE for her outreach work in Chester County and SEPA more generally and represented PA as a member of the state NASAT team in 2017. We look forward to working further with Jackie to continue building quizbowl in Pennsylvania. If any of our readers are interested in further opportunities to be a part of GPQB, we are always looking for contributors to help with tournament wrap-ups, advice posts, rankings coordination, and social media. the top novice team from Delaware Valley and the two novices from Wallenpaupack. redemption against Del Val A to take home the title. the consolation bracket—showed that Coach DeVizia’s teams will be around for a while. 3rd place A team, while Pancho A.’s 34 PPG led the 4th place B team. scorer Jacob F.—defeated Hughesville B to claim 7th place. tournament and showed continued growth since their debut at the Big Lake Brawl i February. Both of their teams increased their PPB from their first event and Kyle B.
jumped from 13 PPG at the BLB to an impressive 48 PPG at this weekend’s event. smoothly. It started right at the announced 9:15 time and rounds generally moved at a nice pace. The final bracket—which played 9 games—finished up right around 3:45. Coach Gunther did a nice job navigating a tough 15 team field by having three preliminary brackets and trying to minimize byes. If anything, more staffing in the future would make this event run even smoother. The playoffs mirrored the system you’d see at a wrestling event, where it became single elimination for the championship but all the others would be able to “play-back” into the remaining spots. This system, while not the traditional round robin finals, did work well for the newer teams to get experience and was easy for most teams to follow. growth of novice level events. I look forward to seeing how these newer teams continue to improve and hope to see them at more events next year. On April 7, 18 teams (including 4 Manheim Township house teams) competed on the 25th iteration of Maggie Walker’s high school housewrite, GSAC, with questions at a slightly higher difficulty than the regular high school level. First place went to Great Valley A. Sam Scarfone led them with 87.78 points per game and 22 powers, and Dan, Mark, and Chris each contributed significantly with several buzzes per match. Though they’ve gotten a reputation for high neg rates in the past, it seems that they’ve worked on cutting those down, and their neg count here was comparable with the other top-bracket teams. Lehigh Valley finished second as a result of a 260-335 loss to GV in round 6. LVA’s 22.55 points per bonus was the highest of the tournament, and though Alex did have an uncharacteristically high number of negs (21), his 42 powers and 162.78 total points per game were still extremely impressive. Friends Select A, missing Rudyard, still scored 19.51 points per bonus. Led by Richard’s 63.33 ppg and backed up with a solid performance from Jake, they came within 15 points of defeating GV in round 7 and took 3rd overall. They are definitely a strong contender in the Open division of SSNCT this year. Penn Manor and a team from Downingtown STEM took 4th and 5th, with 13 powers each. PM, a young team led by Connor’s 66.67 ppg, played good games against the teams above them, even converting exactly half of the tossups heard in their game against FSS. The usual A team from Downingtown STEM had already played this set elsewhere, but a strong performance from Nori, Max (a freshman), and Catherine showed that they still have several talented players behind them as well. Hempfield A finished sixth, led by 2018 NASAT team member Will Yaeger with 60.56 ppg. In the first consolation bracket, Great Valley B won each of their afternoon games, with Anshu, John, Rishi, and Dan each scoring at least 17 ppg. Friends Select B had a solid 16.20 points per bonus and another balanced effort from Matt, Jonah, Aidan, and Silas. Lancaster Mennonite was led by Jacob’s 56.67 ppg, and the rest of the bracket was rounded out by three Manheim Township house teams. The last bracket featured Great Valley C, Manheim Township Middle, Lancaster Catholic, Hempfield B, Bermudian Springs, and another house team made up of Nate Rybner playing solo. Each of these teams scored well on a difficult set, and in particular MT Middle’s strong performance indicates they’ll do very well at MSNCT next month. It was great to see a variety of teams challenging themselves on a hard set and nice to watch some of the state’s strongest teams continue their preparation for SSNCT at the end of this month, HSNCT in late May, and NSC in early June. As a current senior myself, it’ll be bittersweet to play the last few tournaments of my high school career, but I’m definitely excited as we all head into nationals season—good luck and happy studying to everyone out there! In the 21st iteration of the University of Pittsburgh’s Battle of the Burgh tournament, thirteen teams, including ten from eight different Pennsylvania schools, came together for a day of competition on IS 173-A. While an Ohio team, Copley A, came away with the tournament championship, several PA teams acquitted themselves nicely on the day. Allderdice showed off their excellent depth once again, as their A and B teams claimed second and third place with one and two losses, respectively. Jamie Faeder continued his rapid improvement throughout the year, leading the A team with 72.56 PPG; Jakobi Deslouches continued his strong year with 61.86 PPG next to him, while Truman Jury and Andrew Gu rounded out the squad with solid contributions. Austin Davis (65.09 PPG) and Alana Dickey (42.67 PPG) led the way for the B team as well. The PPB for the A team was 25.72, around where you want to be on an A-set to have a shot at a decent run at HSNCT, and the B team’s wasn’t far behind, at 23.41. If Allderdice figures out their best four to put forward as their A team at HSNCT, they appear to be set for a nice tournament, and potentially a run into the playoffs. Winchester Thurston came in next-highest among the Pennsylvania teams, finishing 5th overall. Tim Ganger’s 56.80 PPG topped the list for the squad on the day. While still in a bit of a rebuilding phase after last season’s magical run, Thurston is still well-poised to do some damage at SSNCT, coming up at the end of this month. Pittsburgh Central Catholic followed them in the standings, as Simon Sweeney and Zeke Stuart each notched 11 powers in the course of the day. Shady Side, which was Will Davis playing solo, finished 7th. Will led the tournament in scoring at 83.85 PPG, and he put up a solid 21 powers. He remains a solid player across the board and in his specialties, which should help the team to a good performance at HSNCT. Elsewhere in the standings, DuBois made a nice run into the top playoff rounds, led by Drew Reiter’s 32.84 PPG. It’s nice to see them making the trek to keep participating in Saturday tournaments. Chartiers Valley rebounded from a rough opening stretch to win their last four games, while Hampton and an understrength Keystone Oaks both grabbed some nice wins and some more key experience. As the season winds to a close, we’ll be next seeing the top teams from the west during nationals season. Study hard, and best of luck to all on the big stage!